When we consider that the property belonging to Great Britain which is always on the sea amounts to £80,000,000 sterling, it must be allowed that the whole nation is, of necessity, deeply interested in the character of that large and useful class to whose temporary guardianship this vast amount of wealth is committed in its transport across the ocean. That they should be sober, honest, intelligent, virtuous, and even religious would seem a matter of the first concern, especially to those who are con­nected with commercial enterprise and maritime pursuits. It will be readily acknowledged that our seamen possess many noble qualities; but, as far as it respects both morals and religion, it must be con­fessed that they are, as a class (happily, however, with many exceptions) lamentably deficient. Whatever apology may be admitted on behalf of the simple-hearted and confiding sailor, when the peculiar perils and privations of his ocean life are remembered in connection with the allurements and temptations which attend him on shore, the painful facts remain. Illustrations of these abound in the neighbourhood of the docks, in the east of London, where gin-palaces and beer-shops abound, and the number of houses of the worst character exceeds belief. It is in the midst of such associations that our sailors are drugged, robbed, demoralised, and ruined. 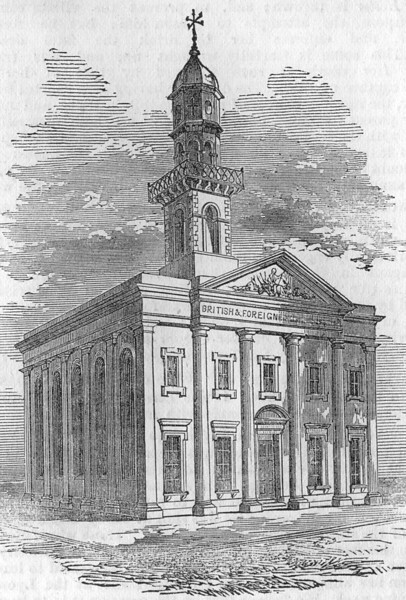 The Directors of the British and Foreign Sailors' Society, who already sustain an efficient staff of active missionaries, daily employed in the visi­tation of ships and lodging-houses, and the circulation of the Scriptures and religious tracts, propose, therefore, to erect in the very midst of these scenes of evil a Building, to the character and objects of which they very earnestly invite the consideration of all patriotic and Christian men. The first stone of the new edifice was laid by the Lord Mayor, on Thursday with; the accustomed ceremony. The British and Foreign Sailors' Institute, Shadwell.—First stone laid THursday last. The edifice will occupy a piece of ground in Mercers'-street, Shadwell 74 feet frontage by 72 feet deep. In the plans the ground-floor is occupied by a library and reading-room, 21 feet by 16 feet; a refreshment room, 20 feet by 18 feet; a savings-bank and secretary's room, 21 feet by 10 feet, a board-room, 25 feet 6 inches by 19 feet; and a lecture-hall, 50 feet by 40 feet, fitted up with an end gallery and raised platform, and capable of holding about 600 persons. The one-pair floor contains three large class­rooms and housekeeper's apartments. The tower is intended to be used for nautical purposes, and for ventilation, &c. The basement will be occupied as offices for the cooking department and for stores. The building will be of commanding appearance, having bold three-quarter columns and pilasters, on Portland stone plinths, to the front and north side, in the street adjoining, with a large centre pediment. The architect is Mr. Charles G. Searle, of the Poultry ; the builder, Mr. Thomas Ennor, of Hardinge-street.